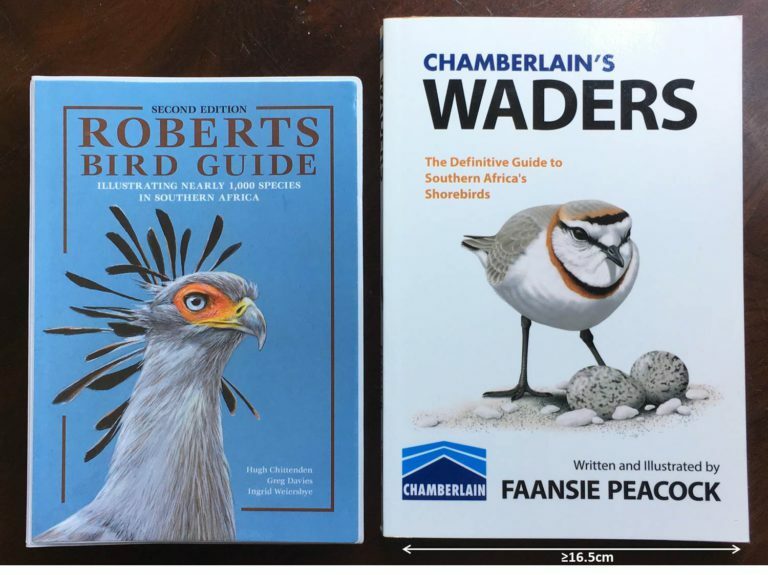 It is not often that one would associate a well-known local hardware store with the publication of some of the southern African subregion’s most informative field guides, quite possibly the most loved and favored among the southern African birding community. When it comes to birding, the name “Chamberlain’s” goes synonymous with the name Faansie Peacock, a curly-haired bird nerd, expert and well-known author of both Chamberlain’s LBJs and, most recently, Chamberlain’s Waders, both of which are without doubt the subregion’s authoritative sources when it comes to their respective specialist topics. The world of birding is fortunate to have high quality field guides, which extensively cover the avian life of the southern African subregion, making it easy enough to prepare for those wishing to visit any one of the countries of Namibia, Botswana, Zimbabwe, Mozambique, South Africa, Lesotho, or Swaziland. This being said, the region, before 2012, lacked high-standard literature which focused on a specific topic, literature which would elaborate on information otherwise left out in any of the other available conventional field guides due purely to lack of space. This is where Faansie Peacock’s latest two publications come into play, for they have well and truly filled the gap in terms of ‘specialized’ avian literature for the region and have no doubt played a large role in further developing the knowledge of birders across the region and the world. These two field guides are not what one would class as ‘conventional field guides’ but instead are works of avian art in terms of both the artwork and the text found between their covers. Faansie Peacock’s meticulous nature and attention to detail can be rivaled by only a select few. This is shown in his ability to capture the finest of details through both his texts, but more noticeably through his artwork, through which he is able to set the scene for his readers so well that it almost feels like one is out in the field, enjoying the bird rather than simply looking at a plate in the pages of his books. This does justice to his philosophy of “a picture is worth a thousand words”, as each image has you craving more, each paragraph urging you to read further. 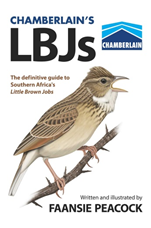 A field guide aimed at providing helpful, informative insight into the often daunting and complicated identification of southern Africa’s trickier bird species, known the world over as “LBJs” or “little brown jobs”. This field guide was the start of it all and was ultimately one of the best pieces of literature on the region’s birds to have hit the shelves in a while. It was the ‘eye-opener’ for many and was the first proper introduction for the region’s birders to the new world of digital artwork. If the gorgeous cover of a calling Monotonous Lark isn’t enough to grab your attention, then one of the other 1400 plus illustrations sure will, as Peacock highlights 235 species of LBJs occurring in the region. 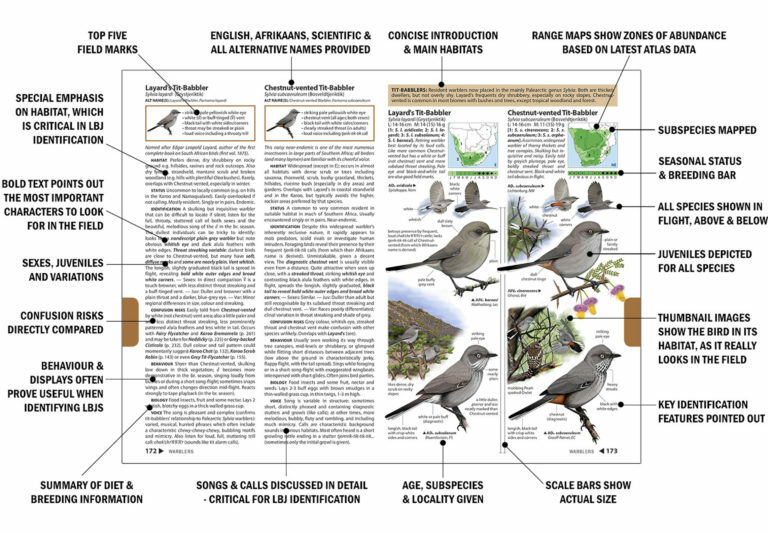 This coupled with the visually easy, stunning, annotated species plates (which provide readers with key ID features depicted on the bird itself), accurate distribution maps highlighting whether a species is a resident or a summer/winter migrant, the incorporation of a seasonal status bar beneath the maps, allowing readers to have an idea as to which months a species is most likely to occur or breed, with peak months showing a large circle and other months a smaller circle, each species’ conservation status according to the IUCN, and color tabs separating the book into seven different chapters, making for a quick and easy family search, add up to make this field guide user-friendly and simple to understand, yet not so simple as to take away from the complicated nature of LBJ identification. 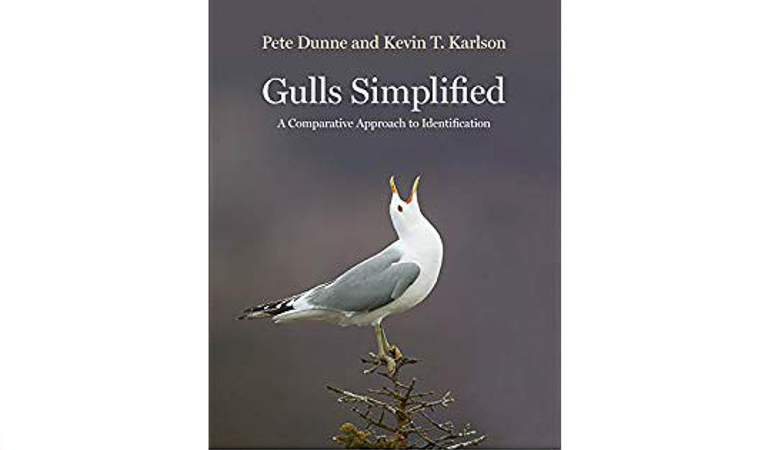 It is a book which appeals to both the eager beginner and seasoned birding veteran and one whose text highlights everything from ID features to confusing species, habitat, and behavior. A feature which can be found throughout both of these field guides, and one which simply has to be elaborated on, is the almost unbelievable attention to detail. Detail is crucial when it comes to bird identification, and often birders struggle to reach a conclusive ID because their field guide simply lacks sufficient detail, more specifically detail in terms of context. What is meant by this can be found in each and every plate of all 235 species, where the bird is depicted in either its specific habitat, striking a characteristic pose, or shown in a setting such as a car park with a car’s wheel in the background and, in this example, the House Sparrows in the foreground, or in an arid setting with grazing springbok and a pair of Kalahari Scrub Robins sitting atop a small shrub – the arid biome specialist, the springbok, indicating the fact that this scrub robin is a species that prefers more arid regions. Attention to detail is amplified even further. When one takes a look at the warbler plates, for example, one can clearly see this as note is taken of primary projections and the slightest of differences in plumage between species, no matter how small, as well as an entire section devoted to the in-depth identification of these birds. This is not the only family with detail devoted to it, but minute detail is a common denominator throughout the book. 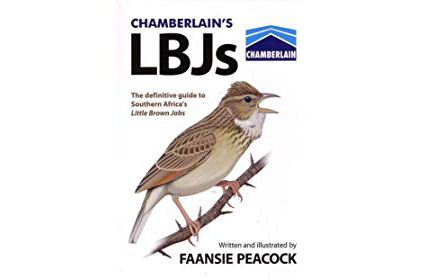 The overall layout of this field guide is very user-friendly and appeals to those who struggle with picking up the finer details of a bird, which can often mean the difference between one species and another when dealing with LBJs. 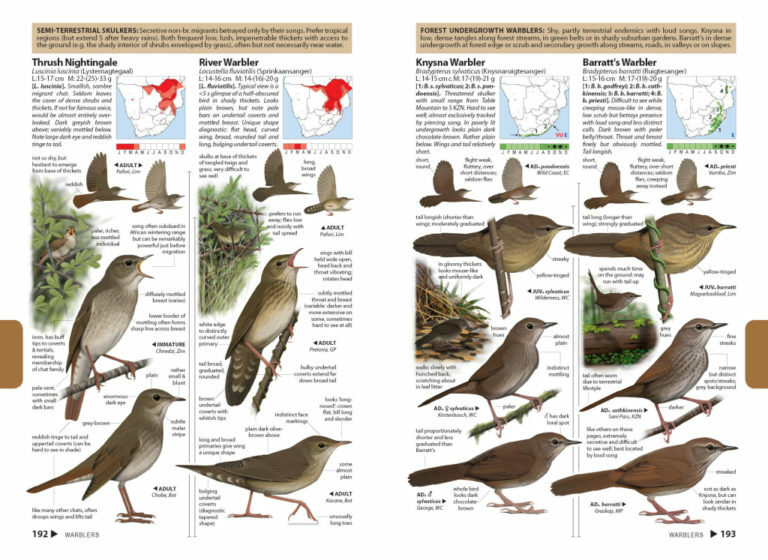 The side-by-side placement of species that are frequently confused with one another and the depiction of these species in characteristic, yet similar postures, along with the accompanying annotations, combine to help the reader to easily distinguish the differences between species and contribute toward the guide’s overall user-friendliness. The book itself is good to use in the field, not too large and not too small. It is slightly larger than the conventional field guides we are familiar with down here in the southern parts of Africa, but it most certainly isn’t the largest. The volume is 24.5 cm in height and just over 16.5 cm in width. This field guide is most definitely a ‘must have’ for any avid birder, whether budding beginner or ornithologist. To those traveling, or planning to travel, to any one of the seven southern African countries this field guide would be a fantastic addition to their traveling library and will assist greatly in not only enhancing the overall birding experience but also allowing to effortlessly identify species which would prove challenging even for local birders. Highly recommended! A field guide which aims to shed light on one of the world’s most complex avian groups, waders/shorebirds, focusing specifically on those occurring in southern Africa. The latest addition to the Chamberlain’s series and even a step up from the best-selling Chamberlain’s LBJs (see above), this field guide tackles some of the world’s toughest taxa, using incredible artistry and high quality, informative text. As with Chamberlain’s LBJs, this field guide is another clear example of Faansie Peacock’s meticulous nature and breathtaking attention to detail, which readers experience from the get-go by simply looking at the gorgeous cover, which depicts a breeding- plumaged adult male Chestnut-banded Plover standing near its dirt-scrape nest and cryptically-colored eggs – an iconic shorebird of the region. Faansie Peacock has improved on what was already a best-seller in the form of the above- mentioned Chamberlain’s LBJs, and where we thought it would not be possible to enrich an already phenomenal field guide formula, he has proved us all wrong. The reader is immediately greeted with several new tweaks within the first couple of pages. 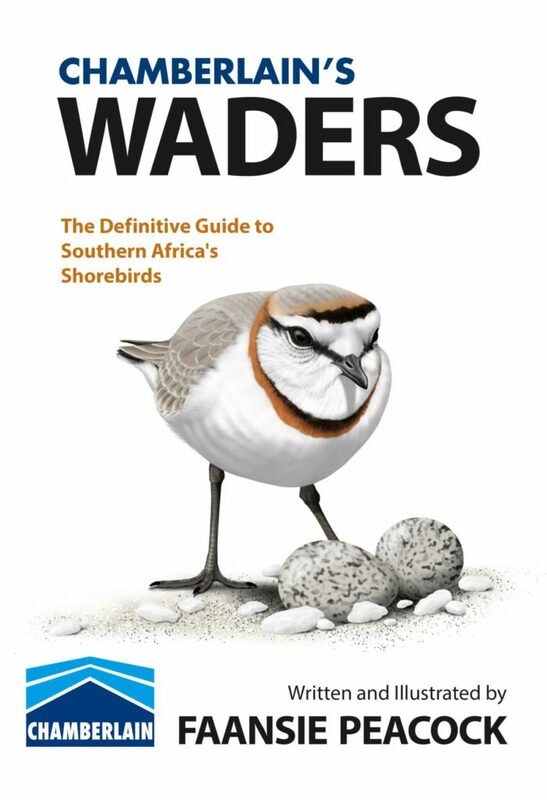 The first is a guide to southern Africa’s top wader-watching sites, which showcases 17 of the best sites to admire waders as well as lists potential species which one may encounter at each site. 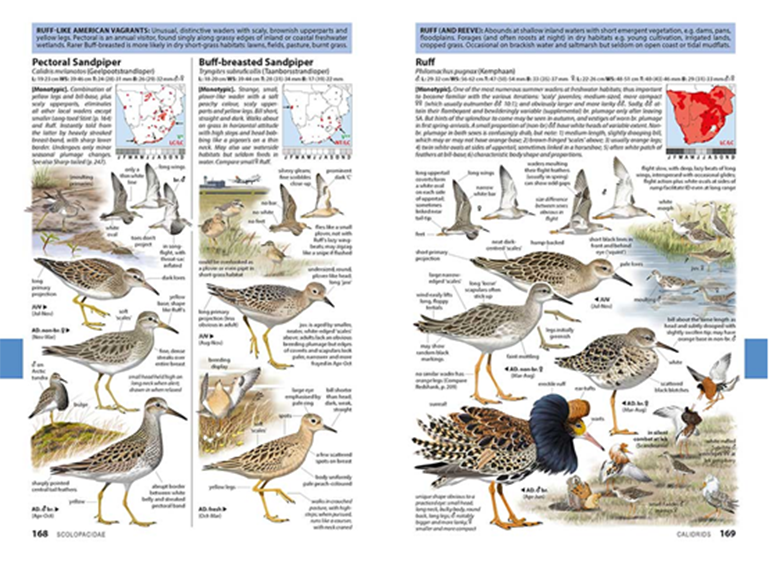 This is a fantastic addition to the guide, which allows the reader to enjoy the incredible content and then take knowledge gained from the guide into the field and put it to practice in a “page to stage” manner by exploring some of the highest-quality wader-watching sites the region has to offer, some of which are not nearly visited as often as they should be due to birders not having sufficient information on them. This section of the guide seems to fill this hole. Another new feature is the inclusion of a “to scale” visual index. Had there been any form of criticism regarding the Chamberlain’s LBJs guide, it would have been the lack of such an index. Frequently when in the field birders will quickly page through to this visual index in an attempt to assist them in their ID when faced with a species they are struggling to identify, so usage of such indexes is rapidly growing among birders in today’s day and age. 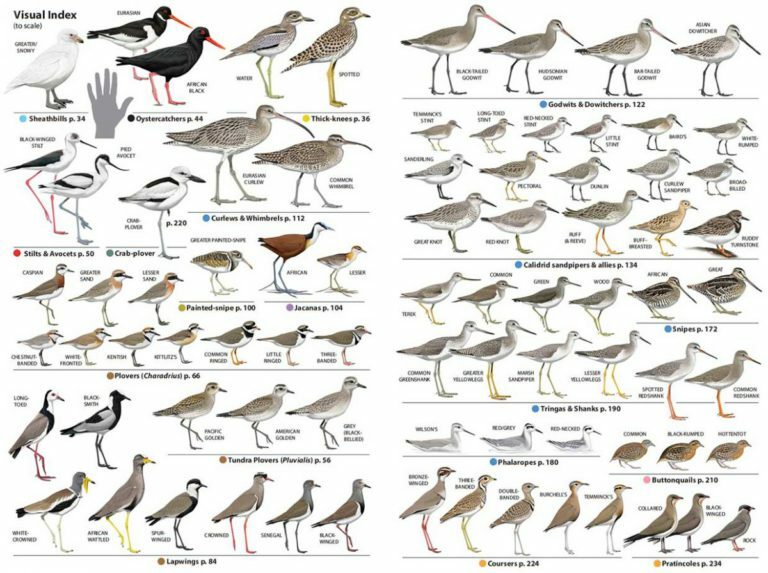 The very modern, new look of the Chamberlain’s Waders index is a great addition to the guide and makes attempting to identify what exactly one is looking at a much easier process than the often tedious sifting through a guide page by page in a hopeful, and often unfruitful, search. What makes this visual index unique is the depiction of birds to scale in comparison to a human hand, allowing one to immediately begin to get a feel for the size of a bird before even flicking to the respective species’ plates and text. Migration is a hugely important part of the world of waders, and Peacock does this justice by highlighting the complexity and sheer mammoth migrations that some of our world’s waders undertake before we end up enjoying them on our shores in whichever part of the world we may find ourselves. 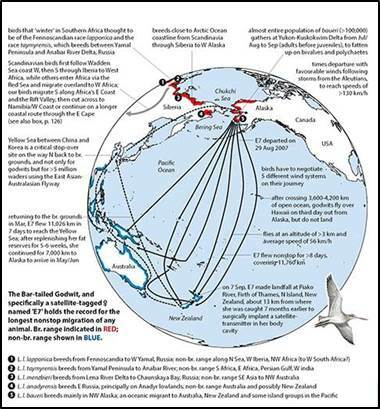 Annotated diagrams plot the routes of some of the world’s migration “heavyweights” in the form of the tundra plovers (the Grey Plover and the Eurasian, Pacific, and American Golden Plovers) and godwits, clearly defining breeding and non-breeding grounds, stopover points, and the general direction of migration. This added information opens the reader’s eyes to a whole new aspect of birding and to the wonders of migration and makes one look at the birds in a completely different light. 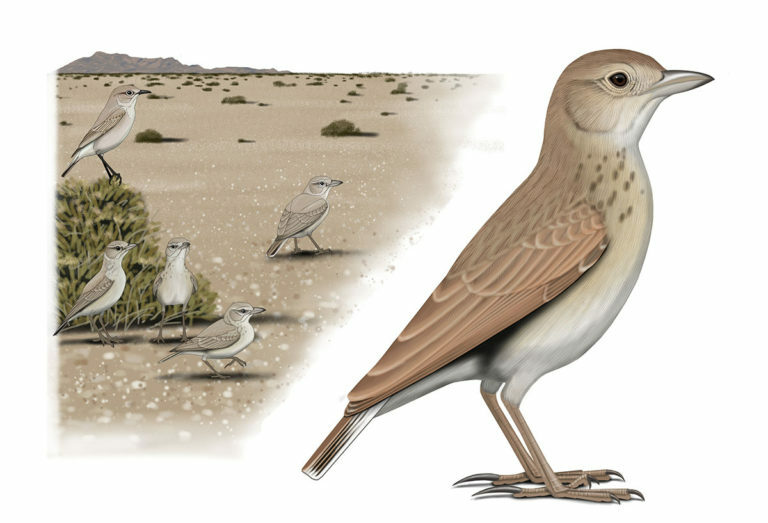 Also included are fascinating insights into how bird migrations were originally discovered as well as how some species’ names in specific countries are linked to their migratory habits. Another feature of this field guide, which makes it a valuable addition not only to a southern African birder’s bookshelf but also to any world birder’s bookshelf, is its international relevance. 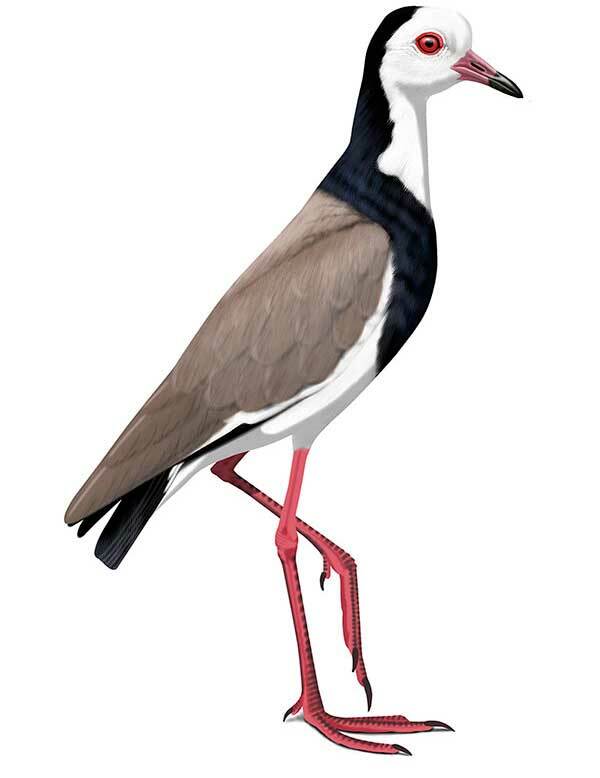 All waders are depicted in every plumage, even if the chances of seeing any of these plumage variants in the southern African subregion are minimal to none. This means that through Faansie Peacock’s artistry we are transported to places such as Siberia, where male Ruffs are depicted competing for females on their leks in all their breathtaking glory, or taken to the beaches of Mozambique, where mixed flocks of Lesser and Greater Sand Plovers reach numbers in the thousands, all of this while managing to retain the fantastic side-by-side plate layout of species which could possibly be confused with one another and even taking it a step further and devoting an entire extra two-page spread for the extremely-tricky-to-separate “peeps” (genus Calidris). 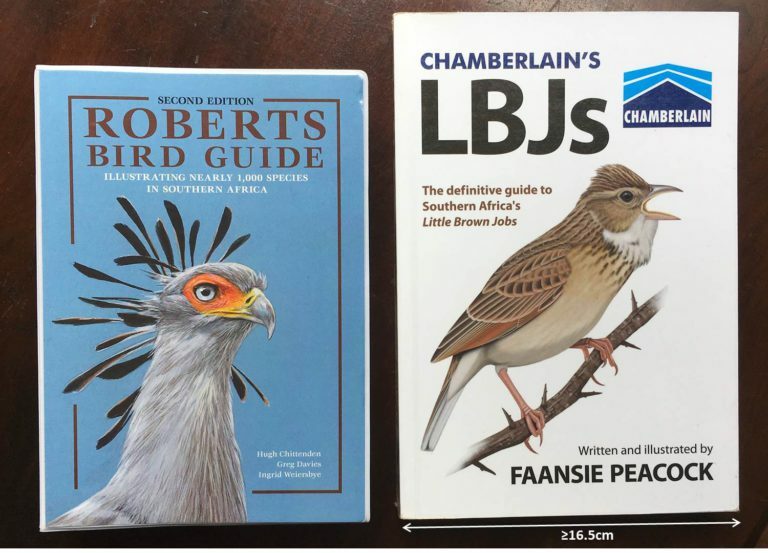 The book is the exact same size as Chamberlain’s LBJs, but pictures depicting its comparison to the size of the Roberts field guide are still included below. This write-up really does little to convey the true masterpiece that is Chamberlain’s Waders. In summary, this book deserves a place on every birder’s bookshelf, no matter where in the world one might find oneself. It sheds a new light on waders, one which I personally think is one which shines the brightest and, dare I say, perhaps it is the new authority. It is compact enough to take with you on your travels and would be a superb addition to your library and literal artillery if you are planning a trip to any of the southern African subregion’s seven countries. It is the one field guide that I simply was not able to put down and had to read cover to cover, and I can see myself doing that again to try my best to absorb all its incredible content. Highly recommended!